Being a busy college student, I really do not have time to make an elaborate lunch. I hate carrying around food that needs a microwave or fridge. Most days, I end up leaving around 10 or 11 am to come home around midnight when things pick up in the semester. Usually, I find something to eat for lunch because there is always something free in the engineering college but I found that eating all that junk was making me sluggish. I vowed that after the Superbowl and watching Forks and Knives, I was going to attempt to eat better so I would have more energy to last through my long days. 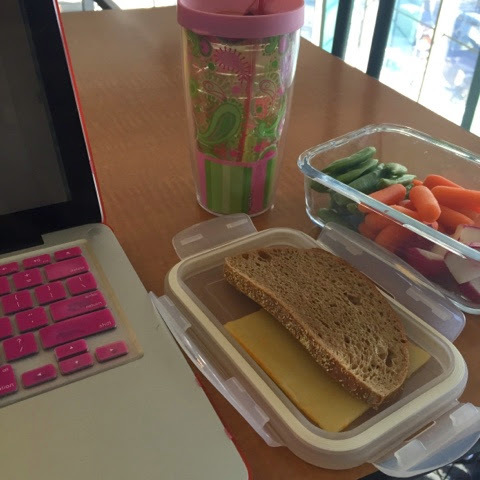 The most easy lunch and filling lunch that I had this week is pictured above. A piece of low fat cheese - that day it was Muenster, a piece of whole wheat pane - unsalted bread, an assortment of veggies with hummus and a ton of water. I usually end up eating some sort of soup for dinner, a couple of snacks like bananas or oranges during the day as well. I feel a lot better and more energized because I've been getting back to my good eating habits. In fact, I've been drinking one(!!!) cup of tea a day this week with the exception of Tuesday where I got 4 hours of sleep. Healthy eating really helps your body recover faster, work more efficently with all the good nutrients and feel great - I don't know why I seem to forget that sometimes!